For me it started a few months ago when Jenna told me that Mo, the Mom who had been here for our Slumber Party, was heading up a committee to do the first ever Father Daughter Dance and wanted to know if I would join. In particular, would I take the photos that would come as part of the ticket price? They know I like to take pictures and that I like to be involved at the school and by doing this, I would get to be there for the dance, to experience it all first hand. I want to take time out for a moment to share my excitement about the fact that Jenna and Mo were elected Co-Presidents of the PTA for next year! I am so proud of both of them and if this dance is any example of what this team will do next year, I predict it is going to be a great one! Now back to the dance! I had so much fun going to the committee planning meetings and getting to spend extra time with Jenna. The dance was to have a patriotic country western theme and they had thought of everything. It was being held outside on school grounds. Friday afternoon the volunteers spent setting up and getting everything ready. They covered the outdoor lunch tables with yards of red gingham oilcloth. They topped each of them with a red bandanna and a small Mason jar vase of live flowers and a small American flag. The only problem we were having was the wind! It was not cooperating. They not only taped the table clothes down they added ribbons around the tables to help secure them which added a pretty touch! They had to add lots of marbles to try to keep the wind from tipping the vases over! Justin and Mo’s husband put up string after string of twinkle lights that the committee had borrowed from everyone they knew. The crepe paper was ruled out because of the winds and they really didn’t need it. There were silver, red and blue stars everywhere. They had rented bales of hay to use as props. They even had a horse head and rope like cowboys use to practice lassoing set up next to the stage. The dads and girls could (and they did!) try their hand at roping a cow. 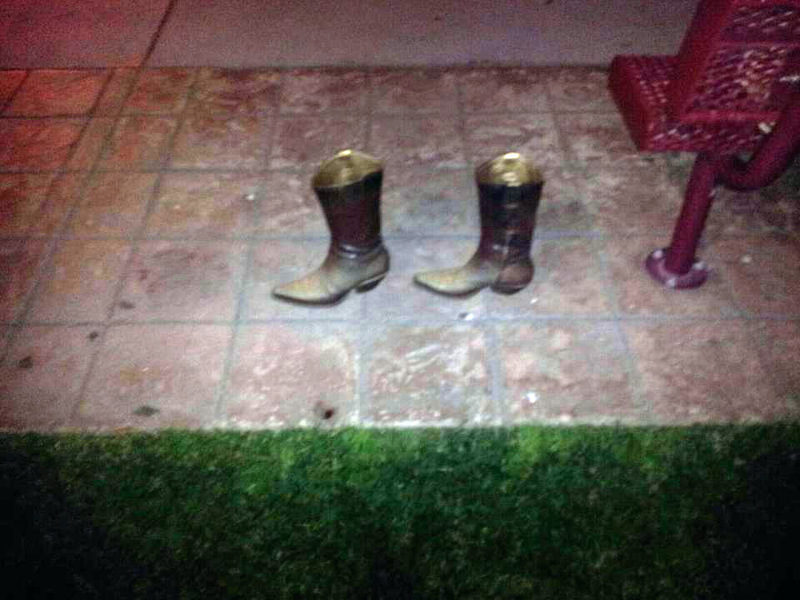 There were little black cowboy boots made from construction paper and complete with gold glitter stars that lined the walkway from the registration desk at the front of the school to the actual dance area. They hadn’t forgotten a thing and it looked amazing! They hired one of the local restaurant food trucks who served hot hamburgers and fries to all the guests. For dessert they had homemade cupcakes and sliced watermelon! In keeping with the country western theme, they rented a country western band for the evening. Everyone was a little worried – would anyone dance? They danced! Oh did they dance! The band even received lots of requests from the girls for old classic songs like Farmer in the Dell so that they could try and square dance! The dance was certainly a success. With the help of Jenna, my awesome photo assistant, I spent most of the evening doing the photos. We wanted these photos to be a special memento of the evening. 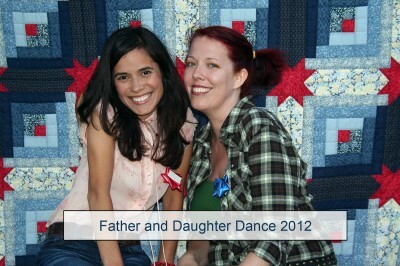 We had set up two bales of hay for the dads and daughters to sit on. One of the Moms had even loaned us a beautiful saddle to use and many of the girls opted for sitting on it to have their pictures done. As the perfect backdrop for the photos, we used the blue and red quilt that my Mother had made for me about 10 years ago. It really does look perfect in the pictures and everyone raved about how beautiful it is. (Thanks Mom!) The one problem with the quilt was those winds! There were times it billowed like the sail on a big ship and Jenna was really worried (freaking out) that it wouldn’t stay in place. But it did! I didn’t get to see a lot of the dancing as we had a line for photos from the beginning at 6:30 until after 8 PM. However, I got a wonderful view of it in a different way. I was able to see how cute each “couple” looked. Many of them went with the western theme and wore country western attire, cowboy hats and even a few marshal badges! Others came in their finest attire! We had fancy dresses and lots of tiaras. We even had a Dad in a top hat! One girl walked around glowing all evening carrying the flowers her Dad had given her. I know I get sappy but it was just so heartwarming to see everyone looking so special! Amara and her Daddy looked mighty fine, too. Amara’s other Grandma had made her the cutest cowgirl outfit and Jenna found Justin a cowboy shirt to match at the Salvation Army. They looked so cute together! Jenna dressed like a cowgirl, too! She even wore cowboy boots that she bought when she got Justin’s shirt! Thankfully Jenna brought backup shoes as her feet were killing her! The dance wrapped up with the raffle drawings. The committee had worked to gather prizes for the raffle drawings that would encourage the Father and Daughter to go on a second date! I told you they thought of everything. One of the highlights for me was when the dance was over and I was taking everything down. Amara and two of her BFFs came over carrying big stars, jumped up on the bales of hay, swung the stars over their heads, and asked me to make a wish on them! I love being a Grandma! UPDATE: Since this was written in 2012 there have been more annual Father and Daughter Dances. This memory was posted in Special Occasions, Volunteering and tagged Amara, dancing, Father Daughter Dance, PTA, school on June 13, 2012 by Grandma Kc. What a great idea! In my professional life, I did special events for a local nonprofit agency. This one sounds well done and just plain old fun. I especially love the matching outfits. Great photos too! Grandma Kc you are the best! So special. I thank you from the bottom of my heart. What a delightful recording of a most memorable event! Truly for you all, a family event! You are a most wonderful grandmother, and the fact that you love it shows in every photo and every time you post. Nothing better than family! She is a most wonderful grandmother and wife. She just gets prettier and prettier every picture that I see! I love how their outfits match your quilt in the background as well ! Good times. So nice that the Fathers were remembered, as they are often left out with Father’s Day usually being a bit after school is out. Such cuteness! Being a grandma becomes you… You love it because you put your whole heart into it! What a fun night for everyone! I’m so glad it was a huge success! Good job, Jenna & Mo!! And awesome photos, Grama Kc!! What a great idea! 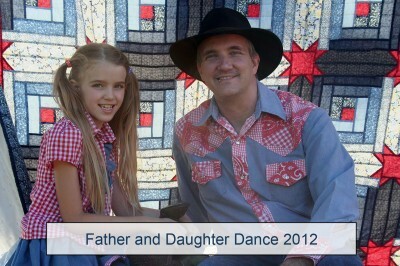 Love that the Dads got into the spirit by dancing with their daughters! This is a wonderful event and one that will leave a lasting memory! 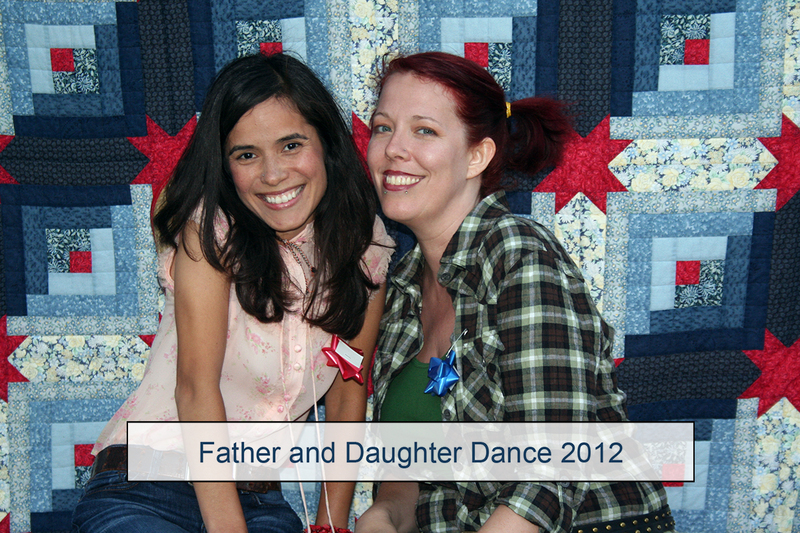 The all girl high school I attended held a “Father and Daughter” dance event for senior students, and I remember being so proud and happy my dad could make the time to attend. Sadly, he passed away the following year, and although he never had a chance to dance at my wedding, I cherish that I had that special night with him. It was a wonderful night for all of us. Your comment brought me to tears, I’m so glad you had that night with your Dad. I did sent your comment on to Jenna and Monique, putting those events together is a lot of work and stress and I knew it would help give them strength as we begin the planning for the 3rd one.